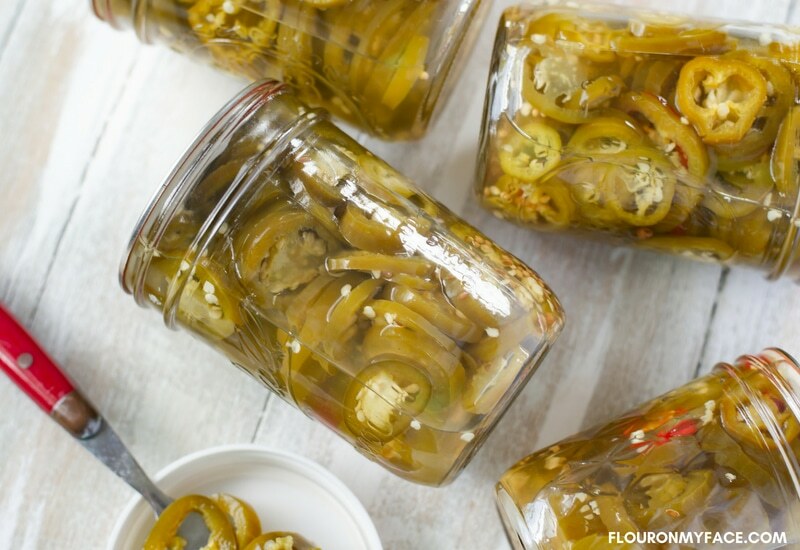 Pickled Jalapeno Peppers is one the easiest canning recipes to make and taste great no matter how you eat them. I love making a spicy chicken quesadilla and piling on the pickled jalapenos but you can use them in so many different ways. Wherever you like to add a little heat a pickled jalapeno pepper is your friend. 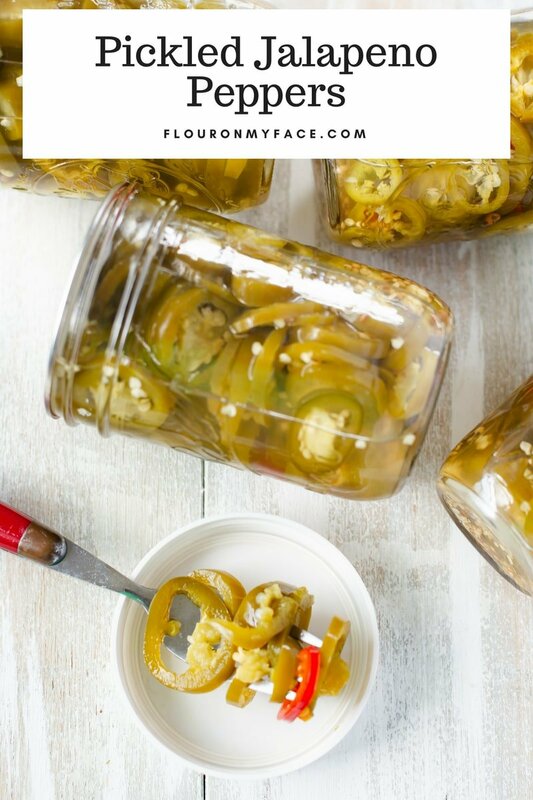 If you planted a garden this year and have a huge amount of jalapeno peppers growing you are going to want to make this Pickled Jalapeno Peppers recipe. You could use this same recipe to pickle any type of peppers. Hot Yellow Banana Peppers are one other type of pickled peppers I can see making this summer. Not a gardener? Not many people are but during the summer months when the farmer’s markets and grocery stores are flush with every type of pepper there is you can also buy fresh jalapeno peppers and pickle them. 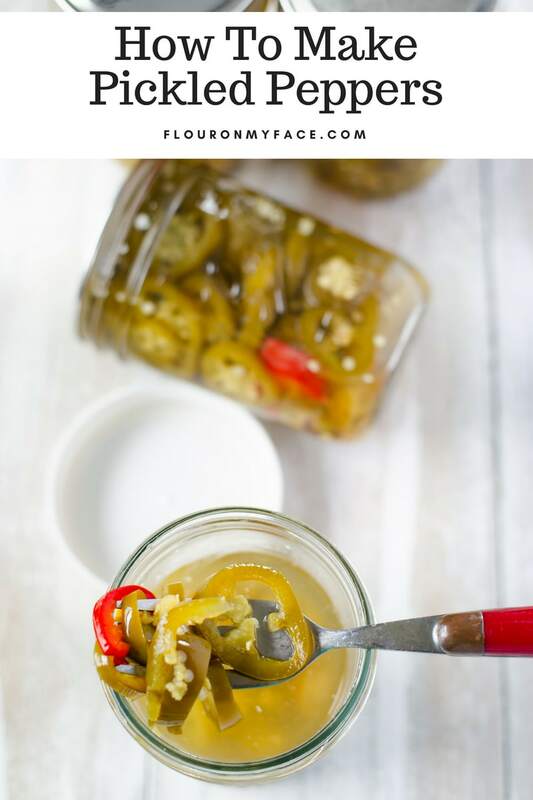 I had a couple of plants of jalapeno peppers growing in a container so I used a combination of my fresh homegrown jalapeno peppers and store-bought jalapeno peppers to make this Pickled Jalapeno Pepper recipe. If you have never canned anything before canning pickled peppers is one of the easiest canning recipes you can start with. You can make Pickled Peppers with jalapeno peppers, banana peppers, pepperoncini peppers and many other types of hot and spicy peppers. I love Pickled Jalapeno Peppers on a chicken quesadilla. I also love to top off a juicy grilled burger with some pickled jalapenos. You can also use pickled jalapeno peppers to make this awesome Crock Pot Jalapeno Popper Dip recipe I shared a few weeks ago. What To Do with Jalapeno Peppers from the garden? My jalapeno pepper plants are full of ripe jalapeno peppers again. 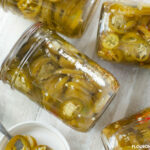 I’ll be making this Pickled Jalapeno Pepper recipe again this week. I’ll pickle all the fresh jalapeno peppers I grow this summer and will enjoy the fruits of my labor all winter long. Prepare your canning jars by washing the jars and lids with warm soapy water. Bring the jars to a boil in a canning pot or the Ball FreshTech Electric Water Bath Canner that I use. Lower the heat to keep the jars hot as you prepare the recipe. Put the vinegar, water, garlic cloves and salt in a 5-quart stainless steel or non-reactive pot. Stir and set aside while slicing the jalapeno peppers. Put on rubber gloves before slicing jalapeno peppers! Cut off the stem and blossom end of each jalapeno pepper and cut into thin slices. Place all the pepper slices (and all of the seeds) into a large bowl as you slice them. Heat the 5 % vinegar, water, garlic, and pickling salt to a boil. Reduce heat and simmer five minutes. Remove one jar from the canning pot at a time. Add 1/2 teaspoon of pickling spice to the bottom of the jar. Pack the sliced jalapeno peppers into the jars. Pack the peppers in a tightly as possible. Remove the garlic pieces from the pot and ladle the hot liquid into the jar leaving 1/2 inch of headspace. With a canning air bubble remover or a wooden chopstick remove as many of the air bubbles as possible. Recheck the headspace and add more liquid if needed. Wipe the jar rim with a damp paper towel. Place a flat lid on the jar and screw on a band to just finger tight. Place each filled jar into your hot water bath canner as you fill it. Process in a boiling water bath canner for 10 minutes. Turn the canner off or remove the canning pot from the hot burner. Remove the lid from the pot. Allow to cool for 5 minutes. Remove the jars from the canner and place them on a dry towel to cool. Allow to cool for 24 hours. Label jars with type and date. Store in a dark cool cabinet for up to 18 months if using the new Ball Canning Lids. Makes 4 to 5 pints of pickled peppers. My number one tip for making Pickled Jalapeno Peppers is to wear non-latex food grade gloves while slicing the hot peppers. You don’t want to end up like I did when I first started making hot pepper jam. It is misery. Always follow safe canning practices and only use trusted and safe canning recipes. Ball Canning no longer recommends heating the flat canning lids to a boil before placing on a canning jar. I still heat my flat lids in a small pot of water before using. Ball FreshTech Electric Water Bath Canner: I don’t know how I managed before I got this canning appliance! non latex gloves: always protect your hands when slicing large amounts of hot peppers. Check out my Amazon Influencer Basic Canning Supply list for a list of basic canning products you will need for canning. 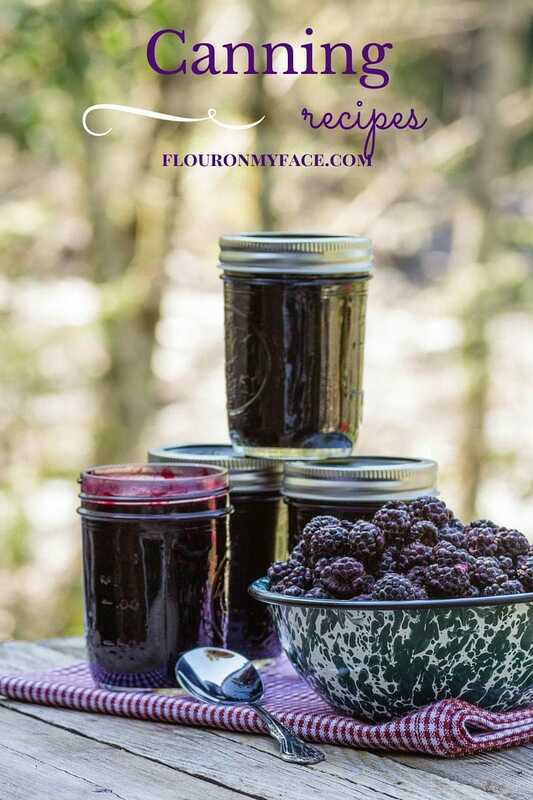 You can find more Flour On My Face Canning recipe on the Flour On My Face Canning Page.